Limited Time GET DIESEL 16 Year Anniversary Sale. GET DIESEL has re-entered the protein market bringing back their Alpha-Omega Protein™ brand originally released in 2009. Back then our blends where made from hormone free dairy, with no artificial sweeteners. During that time the supplement industry didn’t care if a product was hormone free or not and was just in search of the cheapest protein possible. Now we bring you a vegan, dairy free, NON-GMO, grown in North America (not China like most plant brands), paleo friendly protein called Nitrotein™. This protein isn’t here to replace whey or to be sold as some magical protein that is better for you than whey. However there are studies that show pea protein performs equal to whey for lean muscle gains and nitrogen retention because pea protein is high in arginine, BCAA’s and glutamine. Nitrotein is for those of you who are vegan (or vegetarian), allergic to dairy, lactose intolerant or looking to avoid artificial flavors, sweeteners and colors from their protein supplement. Speaking of BCAA’s, I am sure you may not know this, but many popular brands of vegan protein such as Vega and P. Fusion have added BCAAs which should be easily identified as aminos on the label, versus being counted as “protein.” The FDA has recently stated that amino acids added to protein should not be added to the overall protein value and should be listed as amino acids. The problem with other brands (beside the amino acid spiking in the protein industry with cheap glycine and taurine) is they are listed these BCAAs in the total protein content, having the consumer believe they are naturally occurring and from the protein sources listed on the bottle, when they in fact can be from milk protein, wheat or synthetic. Nitrotein gives you a true 21g of protein per serving, with 4g of that being naturally occurring, plant based BCAA’s from the plant source in the protein. As with GET DIESEL products, you can purchase Nitrotein knowing we put out products with the highest manufacturing standards possible and when we say you are getting 21g of protein and 4 of those grams of protein are Branch Chain Aminos from dietary protein, then that’s the truth. This is also why some users will respond to ½ a scoop of Nitrotein the same way they respond to a full scoop of other brands. Protein after protein is being found to be only 50%-70% “dietary protein” and the rest added cheap amino acids. Our protein is manufactured in a pharmaceutical grade manufacturing facility with Australian TGA, Health Canada approval, as well as United States cGMP standards. The problem with adding BCAA’s to a vegan product is most BCAA’s in supplements do not come from vegetables such as peas and rice. Most BCAA’s sold are manufactured in a lab (100% synthetic) or from dairy or wheat. We are not selling you a “Vegan” protein with added BCAAs NOT from a plant source. That makes no sense to us and we see it as misleading. When you purchase a plant based protein product, you expect all the protein AND aminos to come from plants. On another note, we use only Canadian NON-GMO Golden Yellow Peas in our Nitrotein protein. It may cost a little more for vegan protein from North America than grown in China, but we feel when dealing with NON-GMO protein, you want to go with US, Canadian or European Yellow Peas. Nothing against raws grown in China, we use and consume tons of plants and extracts from China; it’s just in the case of NON-GMO (same with Organic), we prefer to use a source that is closer to home, with the same growing standards used in the U.S. for a NON-GMO product. Nitrotein contains a potent digestive enzyme blend at over 400mg per serving of bromelain (pineapple enzyme blend), and papain (papaya enzyme blend). This digestive enzyme blend not only works to naturally hydrolyze (break down into small peptides) the protein after you ingest it; it also improves your overall digestion and nutrient uptake. Typically you may see maybe a 50mg natural enzyme blend in protein products. 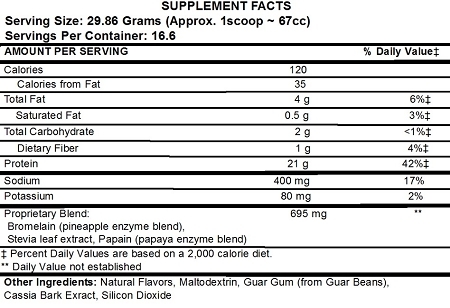 Nitrotein’s digestive blend is so potent; it provides more Bromelain GDU (grams digestive units/gram) than 6 of Now Foods Papaya Digestive support lozenges, and more papain than 4 of these lozenges. Nitrotein also helps to hydrolyze (break down for optimal absorption) the proteins in foods and other protein sources because of this potent digestive blend. This is beneficial when you mix Nitrotein with whey protein or when you consume it in smoothies or with a meal. No other protein powder on the market has a protein hydrolyzing blend as potent as Nitrotein. Nitrotein vegan protein is for anyone who is allergic to dairy, lactose intolerant, vegan or who is trying to eliminate artificial flavors, colors and/or dairy from their diet. Nitrotein is also for those of you who are trying to minimize the intake of artificial sweeteners as it is artificial sweetener free. Some people are not lactose intolerant but may still experience bloating and gas from dairy protein because of its fast rate of absorption, and a reduced capability of your body to digest protein moving through your body that fast. Often people say pea protein separates if you let it sit. Yes it will. The same way if you mash up a bunch of peas and stir them in water…they will separate. Peas are not dairy and do not have the solubility of dry milk protein. 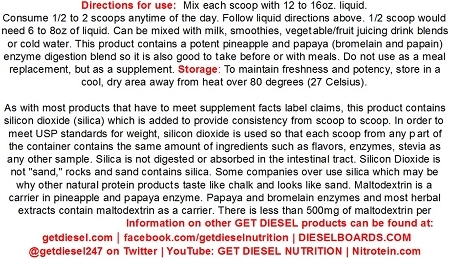 Each scoop is best mixed in 12 to 16 oz. of cold water, in a smoothie, or with milk. Some customers have asked “well why would I mix this with milk if I want a dairy free drink” but they do not realize all milk doesn’t come from cows. There is soy milk, coconut milk or even Lactaid milk (which is however dairy) this can be mixed with. Our advice is to start with ½ a scoop at a time, especially if you traditionally do not drink non-artificially sweetened products, or vegan protein. *Statements have not been evaluated by the FDA. This product is not intended to treat, prevent or cure any disease." Copyright FeFiFo International Nutrition Distributors. All Rights Reserved. eCommerce Software by 3dcart.